One of the hardest things to do as a blogger, is to remain consistent throughout. When I first began blogging back in 2009 I was firing out posts after posts on a daily basis. As time went on that frequency dropped back, and these days I’m taking a much more of a relaxed attitude towards creating content and writing only a few times per week, which means I get to focus more on quality rather than quantity. Regardless whether you blog once a week or multiple times per week, becoming a more consistent blogger requires a lot of hard work and some carefully devised strategies. Here are 5 of these strategies to help you towards becoming a more consistent blogger. If you’re passionate about the main topic you blog about, i.e. Technology or making money online etc, you should never run out of post ideas. Having said that it’s always a good idea to have a list of post ideas at hand to pick from. Thankfully most of us will have a Smartphone of some kind, so if you’re out and about and think of something cool to add to your list of post ideas; you can use your Smartphone to do it. A notebook and pen will do the job just the same. Personally I usually come up with post ideas whilst I’m driving somewhere, as I’m thinking about my blog and usually what to write about next, or if I’m listening to a podcast presentation, an idea will spin off into my head and I’ll need to write it down, but since I’m driving this is impossible, so I’ll use my iPhone’s Siri function to add my idea to my memo. So strategy number one: Create a list of post topic ideas. A small misconception with blogging is thinking that you have to write everything about a particular topic in a single post. That’s not true at all; you can actually break your content down into mini series or parts. I do believe long pillar posts are good, but why would anyone sit and read a 2,500 word long post, I certainly wouldn’t, people that consume content on the web are usually ‘on the go’ these days (consuming content on mobile devices), so keep some of your posts short and sweet, and consider creating mini series type posts instead of long ones. Creating a ‘blogging schedule’ is essential if you want to become a more consistent blogger for sure. Use a calendar (Google Calendar is perfect) to plan out and schedule your posts for going live throughout the week. If you plan to write three times per week and post Mondays, Wednesdays and Fridays, ensure that you fill your calendar with what ever posts you have available for going live on these days. One of my favorite things to do is to vary post formats. Varying post formats always provides something fresh and new for your readers to read. Here is a list of post formats and structure you might want to consider using. Lastly but not least, when you really don’t have anything to schedule in your calendar or you’re planning to be away from your blog for a while (like Abhi :)), get some help from other neighboring bloggers in your niche, which is why building relationships is important in blogging. 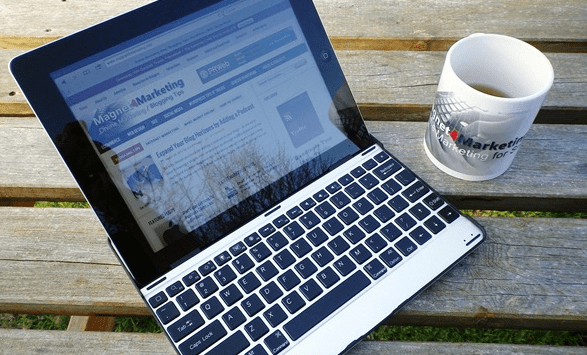 Guest posts are a great addition for adding frequent fresh content to your blog. Moreover it’s also a great way to add content that offers a totally ‘different perspective’ on certain topics. So there it is troops, 5 simple strategies for helping you achieve the status of becoming a more consistent blogger, and as always I’d love to gear your thoughts on my suggestions. Leave me a comment below. Fabrizio Van Marciano is a full time father of two, a passionate blogger, podcaster and online business strategist. He is the founder and editor at Magnet4Marketing and the author of the Smart Blog Traffic Tips eBook. You can follow Fabrizio on Google+. Consistency in blogging is very important, it is good for SEO too, Google knows when to send bots to your site if you are consistent! Good to see you again on my blog. Thanks for sticking around. Good strategies Fabrizio. I dropped from 5-7 times a week to 1-3 now and it’s much better. I write longer posts, more informative and have time to share and comment on other blogs in between. I did not lose traffic since dropping the # of posts I do. I love your variety of posts to choose from to. Gives me a few ideas for the future. Thanks! Hi Lisa, thanks for your comment. Yes that’s one of things that I found dropping my post frequency too, you tend to write better and longer posts. I know which gives me the option of splitting posts or publishing one big post. Glad you liked the list of post formats, I love working from the list to myself. Thank you for showing you continuous support here on OddBlogger. 1. I’ve created a list of post ideas so whenever I feel on writing, I don’t have anymore time thinking about the idea. 2. Series-type articles is in my to do list. Already had few ideas, and my first series-type articles may be released some time next week or next two week. 3. On a tight budget, I don’t outsource. As a student, time is the main constraint. What I always do is writing few articles during friday or weekends, so for the upcoming weekdays, I just need to proofread and publish it. I think this best works for ME. Nice to see that you have a good plan for being consistent. Yes outsourcing isn’t for everyone, though sometimes if you are able to pay for one writer to add great content to the blog, then it’s an option. It was something that I started doing a few months ago myself, but like you said being on a tight budget and finding time to actually look for a writer can take more of your resources. I agree with you consistency in blogging is very important.In my intial stages i was just going after quantity of post rather than quality.But after few months of blogging experience i found out that quantity is nothing in blogging. “I read you were thinking while driving it’s too dangerous buddy” :D.. Anyway thanks for sharing some valuable tips . Hey Gamescay, thanks for your comment. Glad to hear you’re focusing on quality more than quantity, I’ve noticed that as you get use to writing better quality content you can actually increase the frequency slightly. As for thinking whilst driving, I don’t know anyone who doesn’t think whilst driving lol, anyway take it easy, thanks for reading. Great blogging tips. I totally struggle with consistency. I’ll blog a couple days and then not for a couple. My issue is that it takes me way to long to write a post. I don’t know why, but it takes me forever. I want to blog every day or at least every other day, I just need to speed up. I like the list of blog post types. Thanks! Well, I am struggling with the same. Fabrizio was here to help me. I will try to cope up again after my exams. No doubt, a nice one. I will try my best to maintain this with me. I think when you become a blogger and are blogging a lot, maybe you tend to be looking for ideas all the time, so for a while, you don’t run short of ideas. I use an old micro cassette dictating machine to record the blogs, then the hard bit begins – writing it all down. I think if your drawing from your day to day conversations and observations and using your business ideas or whatever, you can make a consistent blogger. Great blog Abhi, I really enjoyed it! Just as you mentioned that if one is passionate about what’s blogging about he/she should never runs out of post ideas, I concurred on that, you also did mention you usually get post idea while driving well, i do get mine when am in the toilet and this kinda hard for me to write it down but i always make use of my phone. With this I will have sufficient posts to published for a whole week even more, but where problem lies is “time to sit down and compose those posts” maybe you can give some tips about that..will really appreciate.